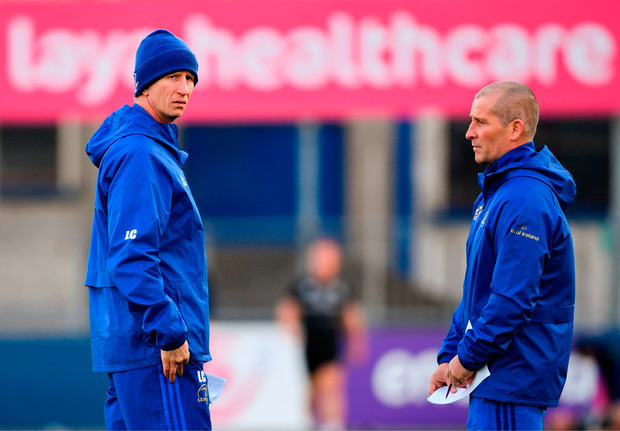 Leo Cullen has eased concerns surrounding Stuart Lancaster's future at the club as he revealed that his senior coach is "very happy" at Leinster. Speculation has been growing that Lancaster could decide to leave the province after his contract expires at the end of the current season. Behind the scenes, however, Leinster are confident that the 49-year-old will still be at the club next season as contract negotiations are currently ongoing. The English Rugby Football Union (RFU) have suggested that they could speak to Lancaster about a shock return to England, while Bath are also reported to be interested. With Andy Farrell set to take over as Ireland head coach following next year's World Cup, Lancaster has also been tipped for a role with the national set-up but, for now at least, that doesn't seem to be on the cards. "He's telling me he is very happy at the moment, so that is all we can work off at the moment," Cullen said. Asked if he expects Lancaster to still be at the club come next season, Cullen added: "We would be hopeful, yes." Leinster, Munster and Connacht are due name their starting XVs for their European clashes at midday. Jordan Larmour (knee) and Dan Leavy (neck) are expected to recover from injury to start for Leinster against Bath tomorrow, who will welcome back a host of Ireland internationals, including World Player of the Year Johnny Sexton. Meanwhile, Joey Carbery is set to start alongside Conor Murray for the first time in red when Munster host Castres on Sunday.